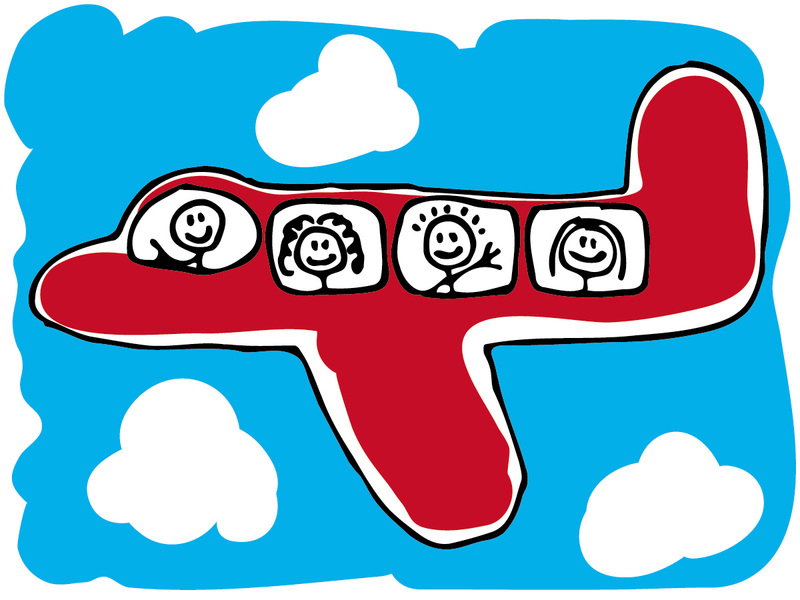 It’s soon going to be holiday season, and I thought I would write a few tips about flying with young children. I have been doing long haul flights with my twins since they were three years old to visit family abroad, so my husband and I have negotiating airports and planes with young children down to a fine art. Be prepared for airport hell, but know it is short-lived. Bear in mind when you arrive at the airport you will have your luggage, your hand luggage, your children’s hand luggage, car seats, possibly a stroller, and children to contend with. It’s not a pretty sight. There is no such thing as travelling light with kids, and people are not always eager to help or be patient with slow-moving meandering children. It’s ok. You will get through it, and once you are through security it’s a breeze. Trunkis are fantastic!! The airport itself is the worst bit of the journey. There’s usually a lot of walking, queuing, waiting and mad dashing. Having a trunki your child can sit on when waiting for security, or be pulled along on when their legs are tired is a godsend. They are a mixed blessing, as you will find if you pull your child too fast on it you may lose them as you round a corner. And there is a very strong possibility you will find yourself carrying the trunki, your hand luggage and your child, but on the whole they are a help. Plus children LOVE to pack them like a grown-up. Plan your hand luggage. Having a good hand luggage system is something I have refined over the years. I recommend that everyone take one small item of hand luggage that can fit under the seat in front of them, in addition to any normal hand-luggage case they take. That includes the kids. You want these small bags to have anything you are regularly going to need for the journey – toys, tissues, books, wipes, medicines… Anything you are not likely to need during the journey, put in the overhead locker. You don’t want to be messing around getting bits you need from those bags either as you get on the plane or during the flight. This is the best way to make your flight time easy and stress-free. I have a small vanity I take for that purpose, and each child has a trunki in the overhead locker and a small backpack under the seat with toys for the journey. I don’t know why it took me several flights to work that one out! Pack a change of clothes for the kids in the hand luggage. Just in case. Let normal rules go out the window. So they want to eat their dessert first – so be it! All children presented with a tray with all the courses in one go would choose dessert first and spoil their appetite. I like to spoil myself on a flight, and your kids will be that much happier if you let them spoil themselves too! Bring a few snacks. Airlines don’t give as much food on planes as they used to, and the gaps between meals can be a bit long for the children (and adults!) Think biscuits and cereal bars rather than chocolate or yoghurts. You’re going to be in the same clothes for a while, and it’s easier to clean off crumbs. Plus, if your plane is delayed you don’t want starving children to contend with. Consider buying some bottled water once through security, as you can’t pack any in your hand luggage. Locate the sick bags as soon as you get to your seat. You’ll be thankful of those extra seconds if the time comes. Bring a variety of toys/entertainment, but don’t show it all at once. Keep the mystique so you can get their attention if needs be. If your kids are happy watching lots of TV, lucky you, you’ll have a peaceful flight. I recommend getting a few new items as gifts, removing any packaging first. It doesn’t have to be expensive – a new notebook, a fun pencil, an activity book. I wouldn’t bother wrapping them as then you are left stuffing wrapping paper in all available spaces. Choose things that don’t need too much adult intervention – you want to be able to watch the movies! This may sound selfish, but being on a plane is the closest thing I get to luxury – someone is not only cooking my food, but giving it to me and tidying it away at the end! And I’m allowed, even encouraged, to eat in silence in front of the TV! Where else do you get that opportunity? So no, this is one occasion where I am not reading lots of stories to my children. They are busy drawing, colouring in or watching TV. This entry was posted in Top Tips, Uncategorized and tagged air travel, family holidays, family vacation, holidays, kids, Kids Travel Tips, parenting, planes, Travel, traveling with kids, travelling with kids, vacations on May 15, 2014 by perplexedparent. Great advice! We might consider it one day soon so this helps!!! Really pleased you found it helpful! Good luck with your super-long long haul! Let me know how it goes.